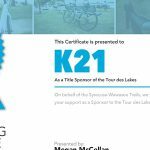 Did you know part of the proceeds from Tour Des Lakes goes to the Syracuse-Wawasee Trails. The Trails department strives to create more public spaces for our community to be active in. We all have heard about the benefit of trails and our health. Be it walking, running or biking, the exercise and being out of doors have proven to improve our health and outlook. But another benefit of a trails system might be even closer to your heart as it can improve your property value. Both the National Association of Homebuilders and the National Association of Realtors have found that trails are the second most important community amenity that potential homeowners find important with looking for a new community. This translates into increased property values as cities and towns invest in a trail system. The “walkability” of a town to areas of schools, shopping and social destinations helps to raise the livability for its residents. And with that it can help to increase interest in an area and that can increase the property values in a neighborhood or town. With the completion of the 5 miles of trails around Syracuse Lake, the continuation of trails through town and the plans to start the process of connecting the remainder of Wawasee to the existing trails we can provide un-paralled access to restaurants, schools and shopping as well as making our community and the neighborhoods that are adjacent to the trails of more value to potential homeowners. So in addition to providing opportunities for physical activity our trails can also be an economic benefit to the residents of the area. There are also benefits to our younger community members. Not long ago, children routinely traveled to and from school by foot or by bicycle. That is no longer the case. The circumstances that have led to a decline in walking and bicycling to school have created a self-perpetuating cycle. As motor vehicle traffic increases, parents become convinced that it is unsafe for their children to walk or bicycle to school. They begin driving them to school, thereby adding even more traffic to the road and sustaining the cycle. The trails department is looking to break this cycle with the availability of more trails. For more information on how trails benefit children visit the trails website. The Tour Des Lakes is excited to help support this investment in our community. 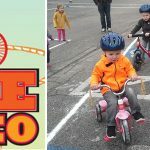 Sign up for Tour Des Lakes today to help contribute!